Seven congregations of anthropomorphic objects constitute Cory Arcangel’s solo exhibition in Milan, which is a complement to the artist’s concurrent exhibition at the GAMeC – Galleria d'Arte Moderna e Contemporanea – in nearby Bergamo. Both spaces have been populated by groupings of sculptures made from pool noodles, colourful cylindrical flotation devices, which stand in for figures, or in this case, for representations of youthful tribes and typically American sub-cultures. Arcangel first encountered these unadorned objects as found or readymade works of art at his local Walgreens pharmacy, where he noted: “Half of the store seems dedicated to catalysing chronic bodily decay, and the other half seems dedicated to the fallout.” By dressing these foam lengths in shop-bought accoutrements and clothing, he attributed each with certain humanoid characters, built around three pre-determined sub-sets of contemporary consumerist America: teenagers (or ‘tweens’, the more specific category for those aged in-between 10 and 12), middle American fans of the rock-rap star Kid Rock and Wall Street traders. While the collective title for this series – Screen-agers, Tall Boys and Whales (2011-14) – mirrors each of these categories, each of Arcangel’s new foam noodle assemblages also have their own titles and tribal allegiances. Leafs, for example, is a solitary green cylinder, subtly embedded with two large-gauge earrings (like those found in extreme body piercing and earlobe stretching practices) each decorated with a marijuana leaf. The work titled Clarity is a pink float wearing black headphones and an armband proclaiming a love of dubstep – the same genre of electronic music that can be heard emanating from the iPod mini, similarly strapped around its limb-like circumference. High Life depicts three pink and blue striped-sock wearing jocks, one with a beer can attached to its drink-holder summit, while other groups of reconfigured swimming aids include the goth-like band of Misfits, who wear skeleton print leggings and are accompanied by a floor-bound stereo, again playing their favoured style of music. Aside from Arcangel’s acute portrayal of contemporary American identity as the sum total of its readily available, mass market hyper-branded goods, his agglomerative sculptures also refer back to specific moments in recent art history, such as the Minimalist ‘planks’ of John McCracken, the consumer good presentations of Cady Noland or Haim Steinbach and, most specifically, to the striped, painted poles of André Cadere. 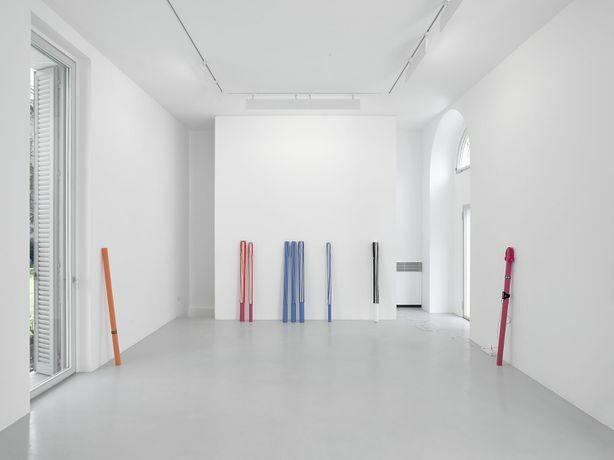 With the latter in mind, the largest installation in Hot Topics is entitled Your Performance and consists of seven multi-coloured pool noodles covered with vertical bands taken from tracksuits or sportswear items bearing the famous three stripes of Adidas. Arcangel’s exhibition in Bergamo, This is all so crazy, everybody seems so famous, includes a further 20 pool noodle works, as well as a new carpet piece, early modified computer games and four of his recent Lake works (reflective, meditative flatscreen videos), all of which will be presented in the historic Sala de Giuristi, the oldest municipal building in Italy.